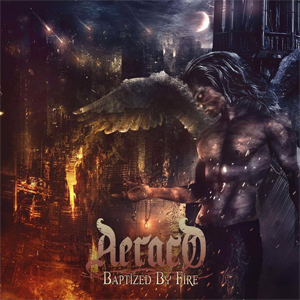 Chicago based Rock Band AERACO has released the Official Music Video for the title track, "Baptized By Fire", from their 6/30/2017 scheduled album. Releasing via Dark Star Records in association with MVD and Sony Music Entertainment, Baptized By Fire was produced by AERACO, recorded and mixed by Bruce "Beast" Smith and mastered by Grammy award winning engineer Brian "BigBass" Gardner. Watch the video on KNAC.COM HERE. AERACO is America’s hard rock band, born and bred in Chicago, IL. Zero cliche’s, no games and you won’t find any gimmicks here. Leave what you know about rock n’ roll at the door and get ready to rock n’ roll! With influences drawn from old school 80’s metal and newer modern metal-AERACO delivers. Having a powerful vocal section, songs with blistering solos and melodic riffs, a pounding rhythm section and hard hitting bass, Aeraco is sure to send your sanity into the abyss.